Aizawl, May 6 : Repatriation of Brus from six relief camps in Tripura will begin from the first week of June, the state core committee on Bru repatriation decided at a meeting on Tuesday. A senior home department official said the meeting, headed by chief secretary Lalmalsawma, decided to resume repatriation in accordance with the Supreme Court's directives to the Union home ministry and the state governments of Mizoram and Tripura. The meeting was attended by the deputy commissioners and superintendents of police of Mamit, Kolasib and Lunglei districts in Mizoram. The repatriated Brus will be resettled in these districts. The Union home ministry recently released an additional Rs 4.7 crore towards repatriation expenses, the official said. Around Rs 7 crore had remained after the last phase of repatriation, he said and added that it would not have been sufficient to send back the Bru families remaining in Tripura. Earlier, Mizoram home minister R Lalzirliana told the assembly that a meeting between the Centre and the state governments of Mizoram and Tripura on January 30 decided that those who refuse to return to Mizoram should be regarded as permanent residents of Tripura after the expiry of six months. 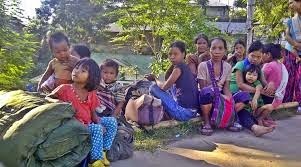 Many Bru refugees, who fled Mizoram in 1997 and 2009 due to communal tension, refused to return and made a series of demands, including increase in rehabilitation and resettlement package from Rs 85,000 to Rs 1,50,000. Repeated attempts by the Mizoram government failed to bring all Brus to the state as many Bru community leaders physically obstructed members of the community from returning.